New: You can now report a problem to Quicken through the Quicken Windows user interface. To report a problem, click Help > Report a problem. Can anyone elaborate on "Fixed: A few user interface issues and text issues." It would be nice to know what UI problems have been resolved. Yes, I read that as well. But doing an One Step Update, before applying the Patch, I disagree. Reason: You can't receive new transactions after just doing the update before applying. I would like testing after the update. I wasn't given a chance to do a One Step Backup. I started Quicken and it immediately updated without any dialog box. Mike, turn on Windows User Access Control and you'll get a prompt asking for your permission before Quicken program changes are made. This is Quicken's responsibility not Microsoft. Yes, UAC is an inconvenient work-around esp. if one is a Power User. The issue is Quicken. Note what they said above. They give instructions for us to follow pre-update yet don't tell us an update in coming - Worse than a Catch-22. At least, with MS I can shut off updates, update at my leisure, sort through what updates entail, etc. 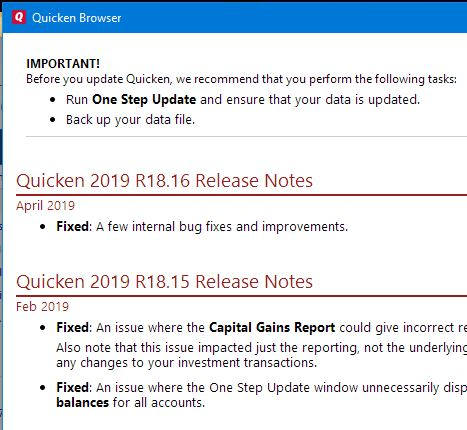 Quicken gave ZERO warning and then in these notes has the gall to say what to do pre-update. This is amateur behavior. I upgraded Quicken 2017 Home & Business R17.4 to R18.6 without any problems, whatsoever. I clicked Help, then clicked Download Latest version. Users who are running the latest version at the time, are not upgraded to the Latest Patch Release as soon as they open Quicken up. 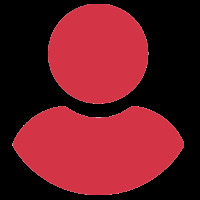 Users who are running older patch releases are upgraded as soon as they open Quicken Up. The Purpose of the Subscription is to make sure that all will be running the same R# Level. This will be in place come May, 2020. When I do Help>Check for Updates it says that I have the latest version which is 17.6. I looked in the Quicken support release notes an don't see release notes for R18.6. What's the URL to these release notes and why does my Quicken think I have the latest version? Quicken for Windows, Home, Business, and Rental Property. Charlie, while I wait for Quicken Inc to change how and when updates are applied, I prefer using Windows UAC so I can control patch application. You are welcome to take your own preferred approach while you wait for the change. Quicken released the Patch in Stages, to make sure that there isn't anything wrong, before releasing to everyone. 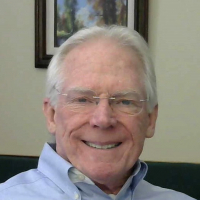 Wait until it is available internally through your Quicken program. 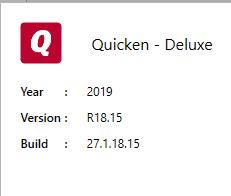 Why would Quicken list the update under Quicken 2017 for Windows Release Notes, Updates and Mondo Patch? The patch is for 2019. The support web site is very disorganized. That's incorrect. The 18.6 patch was for Quicken Windows 2017. You did not disclose the Year of your Quicken Product. Not sure I follow your logic. You are on Q2019 (subscription) and your posting about Q2017. The R stands for release. So why can't Q2017 have the eighteenth.16 release of updates and Q2019 also have as of this date the eighteenth.16 release in software? This is standard IT software development versioning schema. PLEASE add the Quicken version YEAR along with any references to Release numbers. Good point. My original post was for Q2017.